Contributor Frankiez used his DJI Mavic Pro Drone to create this lovely aerial view of the medieval city of Heidelberg, in the Baden-Wurtemberg state of southwestern Germany. 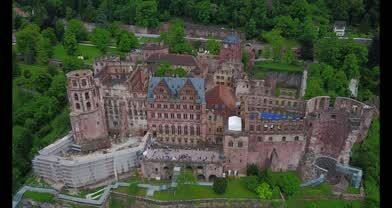 You'll get a marvelous bird's eye view of Heidelberg Castle, built in the 13th century and one of the most famous castles in Europe. In 1622, Heidelberg was the site of an important battle during the early part of the Thirty Years War, in which the Spanish Imperial Army led by the Count of Tilly beseiged and overcame the city.